Teapots and Polka Dots: Next Up! I'm finished with The Amazing Adventures of Kavalier and Clay, and while I did enjoy the story thoroughly, my only criticism is that it was incredibly wordy. Sometimes that was nice--I could just get lost in the strikingly precise and detailed descriptions of New York in the 1930s to 1950s and delve into the inner workings of the characters--but sometimes it got to be a little much. Not to say that it is short on plot--the story is engaging and unique, the characters dynamic and easy to care for--but it is quite heavy on the descriptions. 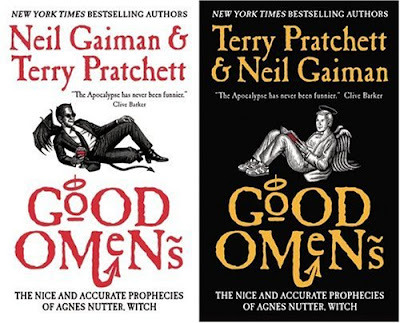 Next up--Good Omens: The Nice and Accurate Prophecies of Agnes Nutter, Witch by Neil Gaiman and Terry Pratchett. The fact that this book is a collaborative work between two fabulous authors immediately caught my eye, as did the Washington Post review on the cover: "Something like what would have happened if Thomas Pynchon, Tom Robbins, and Don DeLillo had collaborated...It's a wow," and the Barnes and Noble employee's description of "a sort of hitchhiker's guide to the apocalypse." I don't know about you, but the Religious Studies major/Neil Gaiman and Tom Robbins lover in me was hooked.